Cows are typically recognized for their ubiquity as various sorts of products, whose value is cashed out in terms of their instrumental value; namely, what they can do for us. Their inherent value as living sentient beings with distinct personalities is often glossed over or totally ignored. Cows are loving mothers, but they are terrorized and abused by our cruel, inhumane factory farm system. Cows are truly amazing and extremely interesting beings. Also known as steak, burgers, beef, veal and leather—and global producers of all sorts of dairy products—many people see them only as food items, mere products of one sort or another, rather than as highly sentient and intelligent individuals with markedly different personalities. For example, cows display a full range of personalities including boldness, shyness, sociability and gregariousness, and are temperamental. Neuroscientist Lori Marino and Florida State University PhD student Kristin Allen address the cow intelligence in a 2017 paper, "The Psychology of Cows," which was published in the journal Animal Behavior and Cognition (and which I summarized in "Cows: Science Shows They're Bright and Emotional Individuals"). "[W]hen cow behavior is addressed," write Marino and Allen, "it is almost entirely done within the framework of and applied to their use as food commodities. Therefore, there is relatively little attention to the study of cow intelligence, personality, and sociality at a basic comparative level." However, even people who work in the food-industrial complex or who are responsible for developing humane welfare guidelines (that all too frequently are ignored) know that cows are sentient beings. Moreover, they can suffer and feel pain—why else would we even bother to develop some regulations that supposedly protect these animals? Still, rampant abuse of cows and other food animals is the rule, rather than the exception. I would love to end with a call to action, but I would like that call to action to be written from the perspective of a mother cow. What would she say to us if she could speak our language? What would she ask us to do? What would she say about her babies? Would she tell us her stories of the tremendous pain having them ripped from her side? Would she beg us for compassion and mercy? What would she say about the dairy industry? Dotsie's question couldn't have come at a better time, as I'd just gotten done talking and writing about animal abuse and the animal-industrial complex, including the highly abusive dairy industry—a huge and hugely profitable conglomerate that makes an incredible amount money off of the backs of countless dead animals. Here's how I answered Dottie's query, freely using the word "children" rather than "offspring" or "young" that are usually used when writing about young nonhumans. These youngsters are, of course, their children, and many behavioral patterns have evolved so that they receive the best parental care possible. If I were to attempt to speak for a mother cow—and I could only do so with limited credibility but knowing she is a fully sentient and feeling being—I'd make it very clear that my children and I are sentient and conscious beings who don't suffer any less than our companion animals such as dogs and cats. But, most if not all people would never allow a dog or a cat to live the sad life of a "food animal" who knows nothing but abuse, fear, anxiety and deep pain. So, I'd ask people why they feel so comfortable subjecting me—a loving mother—to the horrific pain of having a child ripped away from my tender loving care, and why they feel so comfortable about allowing these youngsters to go on to live the horrific and barbaric lives of so-called factory farmed animals, knowing they, too, will suffer and experience deep and enduring pain on the way to a human's fork, knife and plate after being brutally and mercilessly murdered on a bloody killing floor. I'd also make it clear that when people as something like, "What's for dinner?" they should be asking "WHO'S for dinner?" because my children and I—and indeed so many other nonhumans who are consumed in any number of meal plans—were once sentient and feeling beings who care not only about what happens to themselves but so too to family and friends. That would be my call to action as a sentient female, mother and deeply caring being. . . I sent my short response to Dotsie and also to a number of people who encouraged me to share it widely because it raises a number of important points not only about cows, but also about the horrific abuse of millions upon millions of "food animals" each and every year (excluding the countless billions, some say trillions, of fishes and other aquatic beings who are also abused annually). To wit, they are sentient, they do indeed suffer great harm on their way to human forks, spoons and knives, and they care very much about what happens to themselves and to their families and friends. That's why it's essential to ask, "Who's for dinner?" rather than "What's for dinner." The use of the word "who" emphasizes that formerly sentient beings are being consumed. It's important to note that cows also display "emotional contagion," the process by which an individual can influence the emotions or behavior of another individual or group. Marino and Allen write, "A series of studies on a form of emotional contagion mediated by olfactory cues has shown that when cows are exposed to stressed conspecifics they too show pronounced stress responses, such as decreased feeding and increased cortisol release." I often stress that cows and other so-called "food animals" not only see family members, friends and others being killed for food, they also smell and hear what's happening. Mothers and calves also show extreme distress when separated. This is not at all surprising but remains a common practice in the animal-food industry. To bring the discussion of "food animals" into focus and bring it closer to home, I often ask people if they would allow their dogs, for example, to be treated in the incredibly inhumane ways that cows and other food animals are routinely mistreated, and I've never gotten a "yes" to this question. So, why is it that cows and other food animals are brutally mistreated "in the name of food"—given what we know about these bright and emotional bovines and others who humans consume in great numbers? As in many other venues in which nonhumans are routinely and brutally abused, detailed information from scientific studies is not used on their behalf. Along these lines, Marino and Allen write, "Yet, despite empirical evidence for complex emotional, social, and cognitive functioning, there is still a gap between our understanding and acceptance of complex emotions and intelligence between our pets (namely, dogs and cats) and farmed or 'food' animals." It's essential to use what we know on behalf of other animals with whom we interact, use, and abuse. Unfortunately, a "knowledge translation gap" still exists and what we know is not used on their behalf in far too many situations. Basically, the knowledge translation gap refers to the practice of ignoring tons of science showing that other animals are sentient beings and going ahead and causing intentional harm in human-oriented arenas. On the broad scale, it means that what we now know about animal cognition and emotion has not yet been translated into an evolution in human attitudes and practices. Dotsie's question got my brain firing on all sorts of subjects that are important to discuss and to revisit. For example, the words we use to refer to these sentient individuals—products such as steak, burgers, beef, veal and leather, for example—hide what we know about their deep and rich emotional lives. I often wonder how people would view their meals and if they'd change their meal plans if they were referred to as cow, pig or bird. 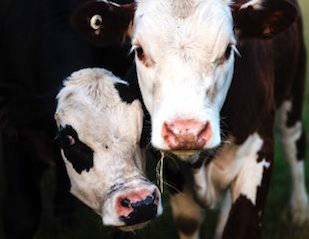 A cow by any other name is still a cow—a sentient, feeling being. I fully know that some people will quibble that cows are indeed respected for who they are, but that we have to use them as we do and they're doing the best they can to give them a "better life." It's worth bearing in mind, as I've written above, that a "better life" is not necessarily a "good life," so feel-good excuses and rationalizations don't really help these bright and sentient bovines or other "food animals." Some people will also claim that Temple Grandin's so-called "stairway to heaven" has solved the problem of pain and suffering experienced by cows on their way to killing floors of slaughterhouses. It's incredibly difficult to figure out why Dr. Grandin calls the path to horrific and bloody killing floors a "stairway to heaven" other than the fact that it sanitizes and softens the horror, deflecting attention from what truly is happening to these sentient beings. We must foster enlightened discussion about the cognitive and emotional lives of all different animals with whom we share our lives and our magnificent planet. It's essential that we understand, appreciate and respect other animals for who they are not for what we want them to be, and that we use what know to protect them in an increasingly human-dominated world.